Following on from my earlier post ‘Words can be tricky, in panels’, I did a new comic page about one of the phrases used when people seek words to make a miscarriage-sufferer feel better. I understand that it’s hard to find the right thing to say at times. Below is my response to “It wasn’t meant to be”. I’m not religious and I tend not to believe in fate or karma; this phrase suggests that such ideas are somehow involved, the presumption being that this will make the situation easier to accept. Fine if it does help some people, of course. The way I see it, for better or worse, nature just does its stuff and may cause sadness, joy or neither. I should probably have put all that in the comic, but I hope to go into it in more detail in my graphic memoir. Do click twice to view larger if it’s a bit fuzzy! I’ve also made a little stamp of my initials, carved out of a rubber, with which to sign future work. 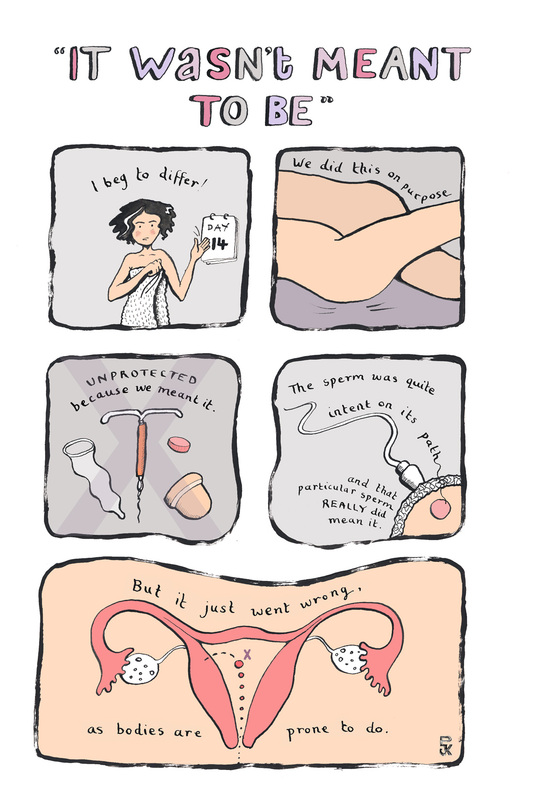 This entry was posted in comics, graphic medicine, The Facts of Life and tagged Art, comic strip, comics, comics and medicine, conception, contraception, early pregnancy, family, Graphic Medicine, illustration, ink drawing, miscarriage, ovum, pen & ink, pregnancy loss, sperm, uterus by Paula Knight. Bookmark the permalink. Thanks Lucy – originally I was going to put a cross through whole thing – not sure why I didn’t but I might do now you mention it – shall try it out at least. I also hate hate HATE the “it wasn’t meant to be” statements, because if you use that logic for a miscarriage (or anything), then you need to apply that to everything else too. So the crack addict who has child addicted to crack – THAT was “meant to be?” Or a much loved child in my life was MEANT to have cystic fibrosis? Or a friend of my husband’s is MEANT to die as a result of skin cancer? I mean, it is so ignorant, and insulting. Thanks for looking! I know what you mean. It’s quite a facile statement but one that I think people use when they feel they ought to have an answer, explanation or some words rather than none. It’s too nebulous for me. It probably comes from a good place but unfortunately stokes the ire of many a recipient! I love the title ‘No Kidding’! I wanted to call my book that a while back, but soon discovered that it was already being used. It’s great.